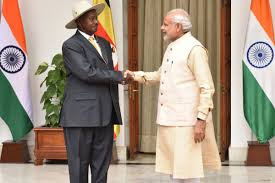 The agreements were inked following delegation-level talks between Prime Minister Narendra Modi and Ugandan President Yoweri Museveni in Kampala. Both leaders comprehensively reviewed all aspects of bilateral relations. India announced two Lines of Credit worth nearly US $200 million to Uganda in energy, infrastructure, agriculture and dairy sectors. India announced to continue to play a stable partner in the country’s journey towards development. It also announced to give vehicles, ambulances and cancer therapy machine to Uganda. India reiterated its commitment of training, capacity building and infrastructure creation as these are the core areas of co-operation between both countries. Both countries also agreed to work together in trade, investment and tourism sectors, supporting mutual prosperity through reciprocity. What was special about the PM's visit? PM Modi visited Uganda on the second leg of his three-African nations tour after concluding his Rwanda visit. After concluding his Uganda visit, he will visit South Africa to attend 10th BRICS Summit at Johannesburg. It was the first visit by an Indian Prime Minister to Uganda in over 20 years. PM Modi also delivered keynote address at the Ugandan Parliament, making him first Indian PM to do so. Q1. How many MoUs did India and Uganda sign? Q2. Who is the first Indian Prime Minister to deliver a keynote address at the Ugandan Parliament?